How have I read the hundreds (probably thousands?) of books that I have without encountering Christopher Koch before? I’ve been aware of the name on Miles Franklin lists (he won it twice) and I’d heard of the film The Year of Living Dangerously, which was based on his book. But I’ve never read any of his work up until now. The Many-Coloured Land is part memoir/part travel narrative/part history. Koch grew up in Tasmania, but his awareness of his background centred mainly on his German heritage – reinforced, no doubt, by questions about his surname- and his Anglo-Irish background that had been thoroughly researched by a genealogy-obsessed uncle. Suppressed within his family history was another great-great grandmother, Margaret O’Meara, a convict from Tipperary. His two Irish great-great grandmothers arrived in Van Diemens Land within five years of each other, in very different circumstances- Margaret O’Meara and Jane Devereaux- one convict, one free; one Protestant, one Catholic; one a servant girl, the other the daughter of decayed aristocracy. The older Koch became, the more he was drawn to the story of Margaret O’Meara, and this book is, in part, the story of his pilgrimage to a ‘home’ land that he only really acknowledged in later life. Koch visited Dublin as a young man in 1956 and remembered it as a dismal, grey, sad place. Returning in 2000 with his friend, the folk-singer Brian, he finds another Ireland. Ireland has changed- it was at the peak of its Celtic Tiger power of the new millennium- but so had he. He is unsettled by the brash, surface-level confidence of the new Ireland and it is only when he moves away from Dublin that he finds the layered Ireland that he seeks. Nothing much happens in this book. They go from one B&B to another; they drink the night away in the fug of cigarette smoke with the beat of Irish folk music thrumming at their feet; they stand on coastlines; they survey landscapes. Koch finds the derelict Big House of his ancestor Jane Devereaux and is drawn to the story of the Young Irelanders who ended up as aristocratic convicts in VDL. Because all this research re-emerged in Koch’s fiction work Out of Ireland, which deals with the Young Irelanders, it reminded me a bit of Kate Grenville’s Searching for the Secret River, without the methodological angst. 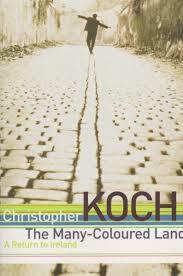 There’s an unintended poignancy about this book, because we know, as Koch couldn’t when he wrote it, just how brittle and insubstantial that Celtic Tiger economy was to be. There’s another poignancy too, in my realization that this writer that I’ve never read passed away last year, and that all his deep inhalation of life, people and surroundings is at an end. As a reader, I have little red flags that pop up when authors do particular things. I must confess that when the book started with family history, I inwardly groaned. Family history, while fascinating to the descendant, can be rather eye-glazing for other people, unless it’s contextualized and the author has convinced you that it’s going to be worth your while. Nor do I enjoy descriptions of food, and I don’t really care what people look like. This book violated all of these no-go zones at times. Nonetheless, I really enjoyed it. It’s a beautifully written plaiting-together of historic research, family history, travel narrative and memoir. And I’m going to track down his other books as well. This entry was posted in Book reviews, The ladies who say ooooh and tagged Christopher Koch. Bookmark the permalink. I think I’ve got this on my TBR but it’s just called Return to Ireland. How odd. I think that the ‘Many Coloured Land’ reference came from the epigraph. I don’t have the book anymore so I can’t check. And I’ve just remembered- this is almost a companion book to the novel ‘Out of Ireland’ in a similar way to Kate Grenville’s ‘Searching for the Secret River’ talked about the research for ‘The Secret River’. I’m afraid your link took me to The Australian which seems to be just a pay site. So Koch is dead? I didn’t know. I very much liked The Year of Living Dangerously. Lol at the Celtic Tiger. So predictable was the house built on cards. How odd. I can get to the link through Google but can’t link from my blog. Curse you, Rupert and your paywall! I’ve changed the link to a more accessible page from those nice socialists at the Guardian. Thanks. House built on cards? I am know to deliberately mix metaphors but that one was a mistake. I’m like you RJ … I have been intending to read him for the longest time but have never quite managed it. I felt sad when he died last year before I’d done so! It felt mean of me. I have seen The year of living dangerously. I loved the film – it’s well worth seeing, if only for Lnda Hunt as Billy Kwan – but it’s probably what put me off reading him because it’s a political thriller style story and they are the sorts of stories I watch but don’t read. It was some time before I realised that Koch was not a genre thriller writer!